A central feature of polymers is the large size of molecular chains which permit the build-up of secondary intermolecular forces. The strength and other properties of polymers are derived from these intermolecular interactions. The degree of these interactions, which are mainly hydrogen bonds, van der Waals and dipole-dipole, depends to a large extent on the molecular weight of the polymer, the packing and orientation of the molecular segments, and the flexibility of the polymer chain. It is this feature that makes polymers invaluable to man and it is, therefore, not surprising that in the past century, rapid advances in polymer science and technology have made possible the development of numerous commercially important synthetic polymers which have found wide-ranging applications in such industries as textiles, plastics, paints, packaging, automobile, aerospace, pharmaceuticals, etc. However, one should not lose sight of the fact that the origin of polymers is natural, not synthetic, as it can be traced to as far back as the beginning of life itself. For example, the natural polymer, deoxyribonucleic acid (DNA), is an essential component of life. Another polymer, cellulose, which is the main structural component of plants, is the most abundant phytochemical. 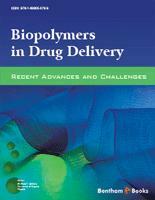 In the light of the foregoing, this ebook, “Biopolymers in Drug Delivery: Recent Advances and Challenges” is a tremendously important and indepth contribution to the subject of natural polymers in drug delivery for at least two major reasons. First, it draws a much needed attention to the fact that natural polymers should be preferred to their synthetic counterparts in the manufacture of medicines because they are more biosafe, biocompatible and biodegradable. To this end, the book resonates with Green Pharmacy concept and practice which promotes the use of natural resources in manufacturing processes as well as improved, safe and efficient processes that enhance the environment. Second, the book has brought together diverse works in the scientific literature on the use of biopolymers in drug delivery. These are published works which, otherwise, may not have attracted the attention they deserve as they lie eclipsed in the literature by undue interest in synthetic polymers. By most accounts, this is certainly an impressive book. The effort made to address the diverse applications of biopolymers in drug delivery is evident in the categorization of the book by the editors into three major sections, namely, Natural biopolymers, Synthetic biopolymers, and Natural-synthetic biopolymer blends. This has not only ensured good organization of the materials in the book but is also capable of focusing the attention of the reader on the limitless potentials of biopolymers. It also does particularly well too in highlighting several current areas of interest in drug delivery - protein/peptide,vaccine, and gene delivery – where biopolymers can potentially be applied to achieve success. Furthermore, the book has brought to the fore some unique works on tropical biopolymers by African researchers that may have been neglected by the global scientific community as is so often the case with published works that do not seem to fit in with global ‘trend’. I have, no doubt, that this book will be well received by all those in industry, academia and other research organizations who continually seek materials for improved drug formulation and development, especially scientists and students working with natural polymers. Biopolymers are increasingly finding wide applications in the targeted delivery of drugs, genes and vaccines. Although synthetic biopolymers have been used as drug delivery vehicles for more than five decades, salient challenges related to their usually polydisperse nature, toxicity and bioincompatibility are still overwhelming. Hence, newer synthetic biopolymers are constantly being synthesized and evaluated for the delivery of various therapeutic agents. Natural biopolymers (which could either be plant- or animal-based) have been used in novel oral and nasal delivery of drugs and vaccines. Most natural biopolymers are bioadhesive and non-cytotoxic. Although prototype natural biopolymers such as gelatin, collagen, alginates and chitosan have been widely used as plausible drug delivery vehicles, there still remains an arsenal of yet untapped biopolymers from nature. These include diverse African tropical polysaccharides (including prosopis gum, mucuna gum, tacca starch) and various tropical mucins (bovine, porcine and African snail mucin). Modification of these novel natural biopolymers has also yielded products with improved drug delivery capabilities. The use of natural-synthetic polymer blends also offer unique and unlimited potentials of modifying the physicochemical and biological properties of the polymers. This book will critically evaluate the potentials of these new generations of natural biopolymers vis-à-vis synthetic biopolymers in terms of their ability to deliver biopharmaceutical and biotechnological agents. Researchers, industries and students would be interested in this concise body of information. The contributing authors are drawn from a rich blend of experts in various areas of biopolymeric drug delivery systems.